Reinvent your company to deliver sustained profitable growth. As performance lags in the midst of economic cycles, many companies turn to magic bullets such as EVA, Kaizen, or Six Sigma. Unfortunately, these initiatives-along with how they're implemented-often deliver only short-term positive impact or cause more pain than the preexisting condition. Returning to competitive health and profitability in the face of economic downturns requires a dynamic realignment of business strategies, organizational design, and talent management. 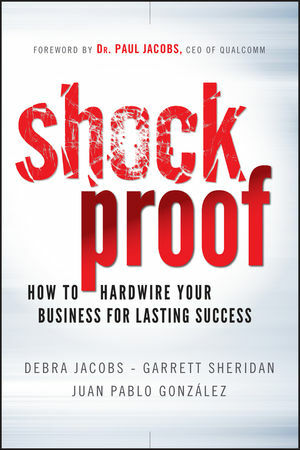 Based on timely research conducted by Axiom Consulting Partners, Shockproof empowers and enables business leaders, owners and managers to make and maintain the necessary connection between strategies and organization to achieve sustainable performance. As priorities change and challenges arise throughout the ebbs and flows of the economic cycle, let Shockproof guide you to reinvent your company and deliver sustained profitable growth in good times and bad.